The anti-drone arms race just got serious. 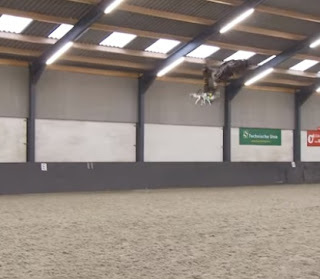 As tech firms and law enforcement experiment with radio jammers and net-wielding interceptor drones to take down rogue quadcopters, police in the Netherlands are trialling a simpler solution: eagles. The country's law enforcement has teamed up with a raptor training company named Guard From Above to see if birds of prey can be used to safely intercept quadcopters. In the video demonstration above, an eagle is seen easily plucking what looks like a DJI Phantom out of the air. However, it's not clear how dangerous this is for the bird. The video makes it look like this is very easy for the eagle, but then they would choose a clean strike to put online.